Perfect for hands that are exposed to cold weather or harsh conditions, The Chemistry Brand Extreme Hydration Complex has an ultra-concentrated, 24% active ingredient formula that contains five hydration active technologies from plant and marine sources to offer deep, long-lasting moisture and produce visible improvements to your skin's texture. Made with a Pseudoalteromonas Complex which regenerates your skin, it also contains tremella fuciformis, a mushroom derivative that delivers hydration below your skin's surface. Meanwhile, the Protective Shield Matrix forms an invisible layer on the surface of your skin to aid moisture retention and protect against extreme coldness. - L.M. water (aqua), dimethicone, propanediol, hydroxyethyl acryalte/sodium acryloyldimethyl taurate copolymer, cetearyl dimethicone crosspolymer, panthenol, isohexadecane, polysilicone-11, glycerin, n-acetyl-d-glucosamine-6-phosphate disodium salt, pseudoalteromonas ferment extract, cyclopentasiloxane, cyclotetrasiloxane, potassium sorbate, tremella fuciformis sporocarp extract, xanthan gum, ethylhexylglycerin, caprylyl glycol, chlorphenesin, citric acid, alanine, proline, serine, sodium phosphate, sodium hydroxide, phenoxyethanol, polysorbate 60, betaine, fragrance (parfum), citral, citronellol, eugenol, farnesol, geraniol, limonene, linalool. This is not cheap for hand cream but it really is the equivalent of a really good quality face cream, it does the job & more! I use the pink one of the Chemistry Company handcream & it is also very good, would recommend it to anyone! Hand Chemistry are a brand who will transform your hands FOREVER. 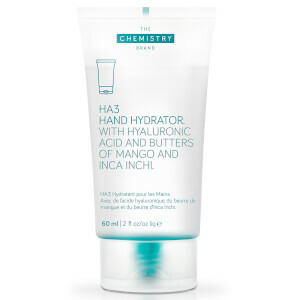 Their HA3 Hand Hydrator is the best in the range by far, and will completely transform the skin on your hands. This product is not as effective as the HA3 Hand Hydrator. HOWEVER, it is a great one to have at home rather than in the purse, as it creates what feels like a protective film around the hands which lasts until the next time they get wet - so ideal for after doing anything particularly demanding with your hands. I would keep this one at home, apply morning and night, and top up with the HA3 Hand Hydrator during the day. Otherwise, its too sticky feeling for use as a handcream throughout the day. Still, I love this brand and I hope they keep up the wonderful work ! The best hand cream I have ever used. I have horses and my hands used to get really sore in winter despite using big brand hand cream. Since using hand chemistry my hands have never felt so good and no more soreness - brilliant - will never be without it. Although this hand cream is expensive a little goes a long way. It is non greasy and leaves skin feeling really soft and hydrated. I have tried many many hand creams, as in my view your hands need as much love as your face. This is one of the best, it may seem expensive but you need to use a lot less than with most hand creams. This is a balm like hand cream but isn't sticky at all and soaks in very quickly. It leaves your hands feeling so soft and hydrated, plus they look so much better. This is a must for winter but I would recommend using it all year round. Easy to absorb, good smell, looking forward to the effect. I love this hand lotion! Up until now I have burnt though hand lotion like it is water and never got the results I needed!! But after a few days of using this my hands were softer and I wasn't having the dry skin issues I am used to getting around this time of year!